Sometimes a little woodworking trick can deliver a lot of value. That’s the case with an operation called “kerfing”. Click below to watch how I use kerfing to tighten up a visible joint that’s got more of a gap than I can live with. Kerning is fast, easy and effective. There’s a written transcript of the video below, to make it easier for you to learn all the details. VIDEO TRANSCRIPT: 00:09 I‘ve got a situation here with this open veranda that I’m working on, and I want to show you a trick that has usefulness in a lot of different situations. I’m installing this skirting board around the veranda. There’ll be another board that sticks out further than this. But the thing I want to show you is the way there’s a gap here, anuneven gap. It’s tight at the bottom between these two boards, and there’s a gap at the top. And this is very common. No matter how accurately you make these cuts ahead of time, there’s always going to be some kind of a mismatch. 00:47 In a case like this, I want a nice tight joint. So the solution is quite simple, and involves a process called kerfing. So you see there’s a wider gap here and it’s tight there. What I’m going to do is I’m going to use this multi tool with a wood cutting blade on it, and I’m just going to, with this board held in place, I am going to plunge this in all along the length of this joint. The kerf of the blade will cut more down here where it’s currently touching than it will cut up here. Probably won’t cut anything up here, and then when I’ve created a kerf along the whole width of the joint, I’m going to move the board over a little bit, hold it in place, and then do it again. And after three or four of these attempts, that gap will disappear. Here’s what it looks like. 02:14 So I’ve kerfed all the way through. If I’ve done a good job, then, yeah, this board moves just a little bit closer. So now we’re still touching there, that’s the interference spot. But you’ll see this gap here is getting smaller. I think one more shot and it’ll be as tight as I needed it to be. So let’s give it a second shot here. 02:52 Here we go. Now that’s as tight as it needs to be. Still little bit of a gap up here, but I have a second skirt that goes down about this far. So really all that’s going to be seen as is this area. The full joint of the second skirt will be seen. But that doesn’t really matter. 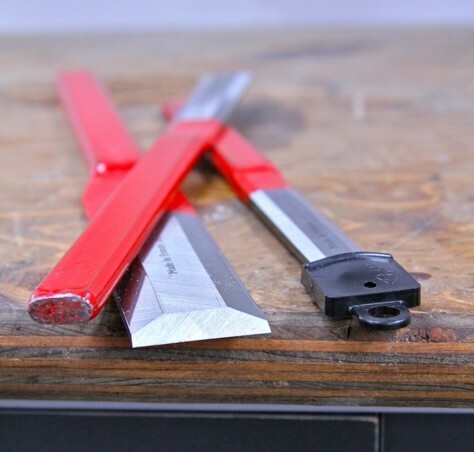 The idea is kerfing and how you can take a not-so-tight joint and make it tight pretty quickly with multiple cuts through the joint with a blade.